I think most of us start out in a similar manner. We begin, of course, the only way we know how- by replicating the public school classroom. We set up a cute little room with tables or desks, put up a few alphabet and shape charts, a weather chart, cute little calendar with pictures of all the holidays and of course a national flag. Our kids are super excited to start “school” as they climb into their little desk. However, after about 15 minutes (if you’re lucky) they start to get wiggly. They may even try to get out of their desk (gasp!) or answer questions without raising their hand (oh my!) After a week or two of frustration trying to keep those little pupils in line (after all if we don’t teach them to sit still or raise their hand, they will never be able to function in polite society) we get frustrated and think maybe we just aren’t cut out to homeschool! Maybe we’re incapable of teaching our children. But MAYBE, we’ve simply approached it the wrong way. There is schooling at home and then there is home schooling. One takes the mundane public classroom, textbooks and workbooks and turns the (semi)peaceful walls of our home into a children’s torture chamber, the other has the potential to turn the walls of our home into an institute of learning where children are free to explore, discover and create. Sounds great, right? But how do we go from rigid routine and teacher-led learning to having children who ENJOY learning and who WANT to “do school”? Well, as I said before, I’m no expert, after all my oldest child is only eight, but in those 8 years I have run the homeschooling gamut with him from structured public school type learning to a bit of unschooling and everything in between. He still complains about doing math- worksheets- not real math, and my seven year old complains about having to write anything down, but they LOVE to read. I mean love to read. They would rather read than just about anything else. If I ask if they want to watch a movie or read a book with me- they choose reading. If I ask them if they want a candy bar or a new book, they’ll choose the book every time. It is awesome! I have dozens (ok, maybe hundreds) of books throughout our home- we have shelves in the living room, “school” room, office, bedrooms, stacked on the coffee table, entry table, bathroom window sill, even in the car. We got rid of our tv and now spend our evenings reading instead of watching the news. When they get to choose what to do with their time, 9 times out of 10 I find them curled up with a book. They let their dinner get cold as they read the Usborne Encyclopedia of World History together, my 7 year old takes 50 Famous Stories Retold with him to the bathroom and my 5 year old reads a Magic Tree House book on our way home from a trip to the Black Forest while his two brothers watch a Wild Kratts DVD. This is the essence of the Charlotte Mason method of learning. She suggests that children are not empty minds with which to program with facts and information, but they are gifts from God with natural curiosity and a strong desire to learn if we simply give them good books and then get out of their way. It has been a very difficult journey for me to learn to let go and give my children the freedom to learn on their own without me controlling every part of their day. However, if I put a science or history book (LIVING book, NOT textbook) on the table and leave it- they will pick it up, devour it and are so excited to tell me everything they learned. I am pretty sure my 7 year old knows more about world history than most high school graduates and you know what? He remembers! Because it meant something to him. It was a story that was exciting to him and history SHOULD be exciting don’t you think? This is just one example of my experience with the Charlotte Mason method of homeschooling and why I strongly promote the idea of reading books as the main “curriculum”. This method can get expensive if you are like me and must OWN every amazing book you read (and not the kindle edition), however if you make best friends with your local librarian it doesn’t have to cost a dime. There is also a notion that once you choose a “method” you must stick with it and follow it to a T. I don’t subscribe to this idea. I consider myself eclectic- I like a lot of ideas from many methods and consider them quite compatible in bits and pieces. For example I love the Charlotte Mason method of living books and learning grammar through literature, but I don’t apply CM in purist form across all our subjects, I like the unschooling ideas of letting children pursue topics they are interested in, so I try and be flexible enough to drop what we’re doing and follow their lead when appropriate. I love many things about the classical method of homeschooling but don’t believe children need formal grammar lessons until much older, I do, however, have them memorize poetry and scriptures at a young age. I love the Thomas Jefferson Education book lists and ideas about reading the classics, but I also incorporate more structured academics. The point being, just because a method speaks to you does not mean you have to follow it precisely. You know your children better than anyone else and you know what works best for them. If something is not working, change direction, try something else. There are no rules in homeschooling, except one– don’t kill the love of learning! Now that I’ve laid out some ideas, what you really need are the practical how-to’s like actually choosing a curriculum. Using books is fine and well but if you don’t even know what books to begin with it can be overwhelming. 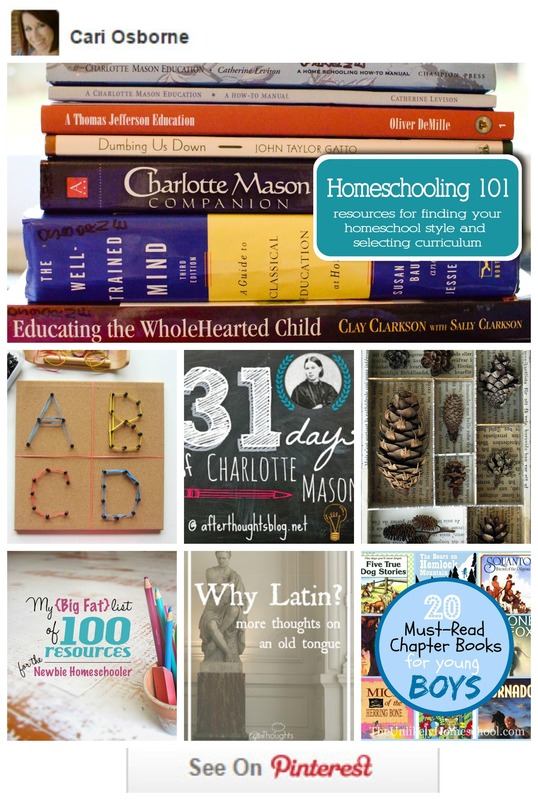 Below I’ve listed a few articles to get you started as well as a few of my favorite homeschooling books. I can’t emphasize enough the importance of reading and educating yourself on the different ideas and methods. If you just jump in (like I did) you will end up changing over and over again which can become very discouraging. If you take the time up front to detox from the public school mindset (you and your children) and figure out the goals for your children it will be much easier to find appropriate curriculum. I really love this site that discusses many of the different styles and philosophies of homeschooling and recommends the most common curriculum choices based on each http://www.lds-nha.org/homeschooling-philosophies. I also think this video overview and quiz is quite helpful. While you may be tempted to go with the state-funded k12 program, I would not recommend this as a long-term solution. I think this type of a program can be very discouraging to the parent and child with all it’s busywork and it only alleviates the social problems of the public school system, not the academic ones. Whether or not you choose a boxed curriculum or a DIY smorgasbord, you will need to do some planning. Every home is run differently and there are a wide range of planners out there. I have created this planner for my family and offer it to you for free- you can modify it anyway you like for personal use, just please don’t redistribute it. Start with goals. List each child’s name and what you want them to accomplish this year, not just subjects to study, but things to learn, places to travel and talents to develop. Don’t forget to make a list for yourself! Research books, curriculum and other resources to go with each goal. There are countless places to find reviews. I first go to the company website and view the samples online, next I try to find a non-biased review. Please bear in mind that many of the blogs with reviews are doing so because they have been given the product free in return for their review. While I believe they do give honest reviews, I have discovered that it’s much easier to rave about something that cost nothing than something that really hurt your wallet but you can’t live without. I personally love Cathy Duff reviews- she is very detailed and gives the pro’s and con’s as she sees them, http://cathyduffyreviews.com. Also, check out Pinterest, there are a lot of great resources there, here is a link to my Pinterest page. Now that you’ve got a good list of WHAT to study, you need to decide HOW to study. Follow your chosen homeschool philosophy to determine the general ideas but when it comes to the daily schedule and routine, that’s completely dependent on your individual circumstances. If you have a baby in the house your routine will have to be much more flexible than if you are homeschooling teenagers. Realize that as long as your children are reading (or read to) and exploring they are learning. The time for strict academic studying is not during these early years, let them be little, let them play, that is how children were designed to learn. For my little guys I set them up with a bunch of blocks or drawing pads and read to them while they play. I find that they retain much more information when their hands are moving. I also have a mini trampoline next to our kitchen table so they can jump during school time when they need to get their wiggles out. If you have boys, you’ll be surprised at how much more they learn when they are moving! The most difficult part of homeschooling (the one I still struggle with daily) is learning to let go. Realize that we cannot do everything every day but what we can do is enough. You may feel discouraged when you read homeschool blogs about overly productive days- but remember, they are sharing the BEST of their day, and you shouldn’t compare that to your worst. Never forget why you homeschool. Is it so your kid can be the smartest? So they can enter college at age 12? So they can be a billionaire some day? Or maybe it is so they can feel loved, accepted, confident, well-rounded contributing members to society? Whatever your reasons, don’t forget them and never let curriculum get in the way or get between the relationship you have (or want to have) with your children. Remember that even if every day doesn’t look like “school” they are still learning more than they would in public school. They are learning real-world experiences, developing character and figuring out who they are and who they want to become. YOU are in charge of your school and if it’s not working for you or your kids, it’s time to make a change. Here are just a few of my favorite resources. Do some reading, get some ideas, try a few things and figure out what works best for your family situation and the learning styles of your children. This is best done before you’ve started homeschooling, but don’t be afraid to ditch already purchased curriculum or let your kids have a detox break while you figure things out. And remember, God has sent you these children and He loves and cares about them more than anyone else and there is nothing He can’t teach you or them. Seek divine inspiration when selecting your curriculum, setting goals and executing your daily schedule. If you’re not currently a praying person, you may have to become one in order to survive homeschooling! It has been a great comfort to me when the going gets tough, to know that this is what God wants for my children at this time.